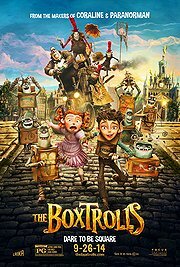 Visually, this The BoxTrolls is next-to-perfect aesthetically. As far as the content of this film is concerned, it’s entertaining and intriguing. However, it’s not always laugh-out-loud funny. Charming would be a good word to describe it. It makes you smile a ton and has its fill of memorable characters, but there just aren’t a whole lot of memorable scenes. You also can’t help feeling like the plot is being stretched too thin, as there isn’t a whole lot that happens in this movie, and the runtime is still pretty short. Sure, much of it is used to establish setting, but it could have definitely ended sooner. The final “battle” scene dragged on for too long. The visuals create a perfect world for itself and I commend it for its beauty, I just wish it was a little more memorable. However, it is rewatchable, which counts for a lot and will, in turn, etch it into my head easier.